I have always been fascinated by animals in the wild. In fact, I don’t consider it a successful vacation unless I’ve seen some — moose in Canada, nene in Hawaii, wild donkeys out west, etc. On one vacation, we saw no animals and I insisted on going to a zoo before heading home. At home, we have pulled into our driveway to see a rabbit, chipmunks, deer, squirrels and a mouse. Once, we came home from vacation and, there, coiled up in the kitchen, was a snake! That I could do without. This is a tale of joy, excitement, and, ultimately, heartbreak. 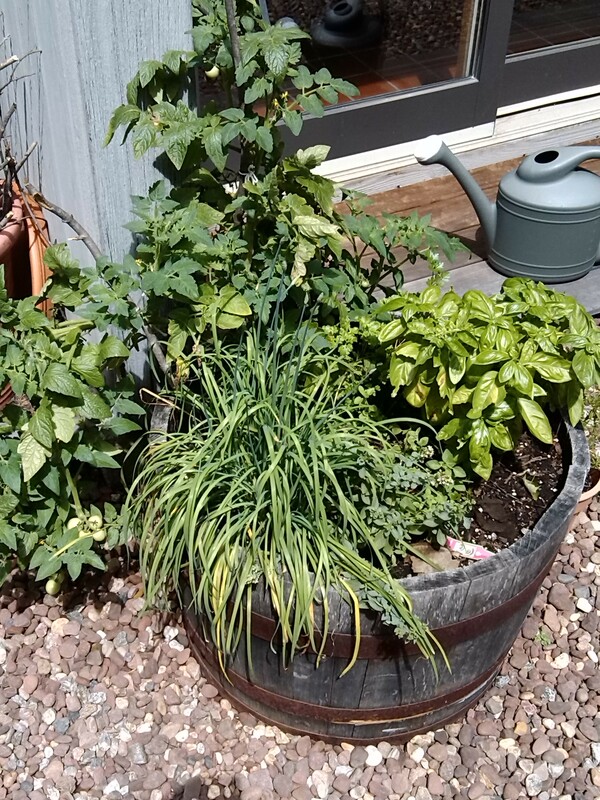 I have a half-barrel in which I’ve planted some herbs and cherry tomatoes. One morning while watering, I heard squeaking. Having never heard that sound from my basil before, I continued to water and up popped what appeared to be 4 baby animals, clearly newly born. Not sure whether they were squirrels, chipmunks, or rabbits, I kept my eye on them in days to come. 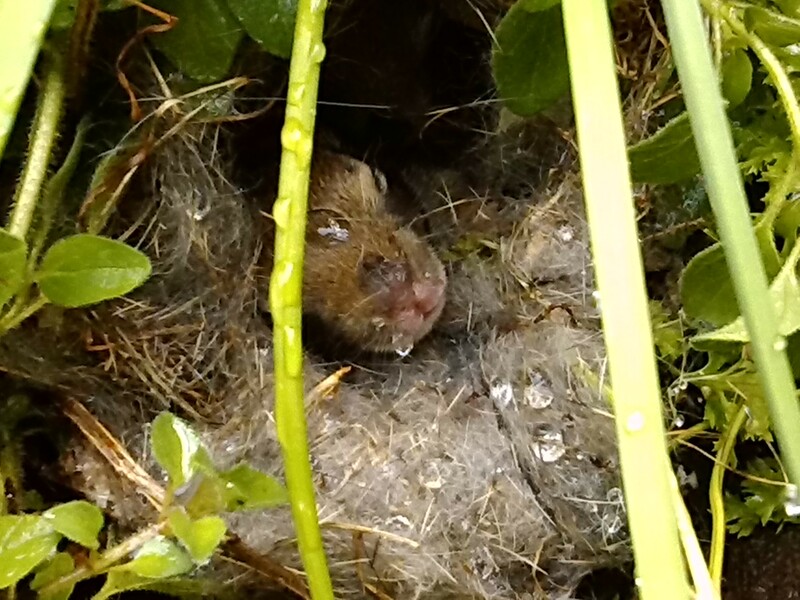 Whenever I wanted to check them out, I gently sprinkled water over their nest and out they peeked. 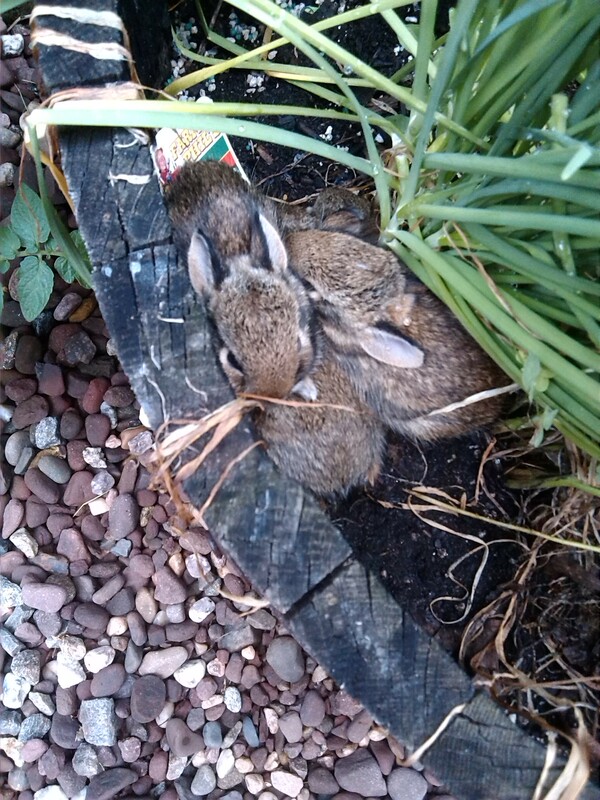 After about 8 or 9 days, they grew hair and were cute little bunnies. We’ve been having a heat wave here. Temps unbearably in the ‘90’s, so I wasn’t too surprised when I found one baby dead on the ground. How he got there, I don’t know! Now there were 3 left. 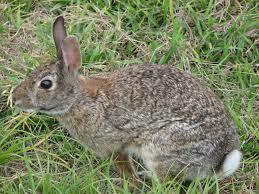 A few nights later, we saw the mother in our yard and, closely behind her, one of the bunnies. Perhaps she deemed him strong and big enough to come with her out of the birthing nest. The next day, I found one of the 2 remaining dead in the barrel. The other sibling was lying close to it. I put out some water in a ramekin, hoping he would get the idea to drink some and prayed for the remaining bunny to make it. I decided to leave the dead one there so the mother could find it. 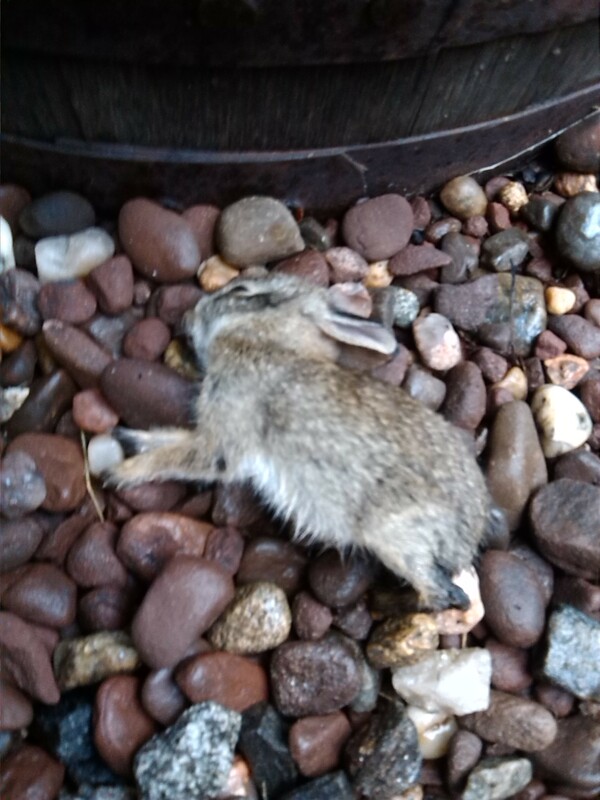 The following morning, the dead bunny was still there and I left it again. Later on that day, the last one succumbed. I left them overnight so the mother would see what happened, but when I got up, and saw them still there, I placed them next to their brother in the woods. Last night, with no live bunnies left, the mother came back. I quietly sat and watched her for about a half hour. She didn’t move or go to the nest. What was she thinking? Why did she come back again? It was so sad to think of that mother giving birth to 4 offspring with only one survivor! Well, if the saying is right, there should be another litter soon; I only hope she finds a better spot to make her nest. Arlene, your story and pictures were so sad. I think you’re right; it was the heat.! 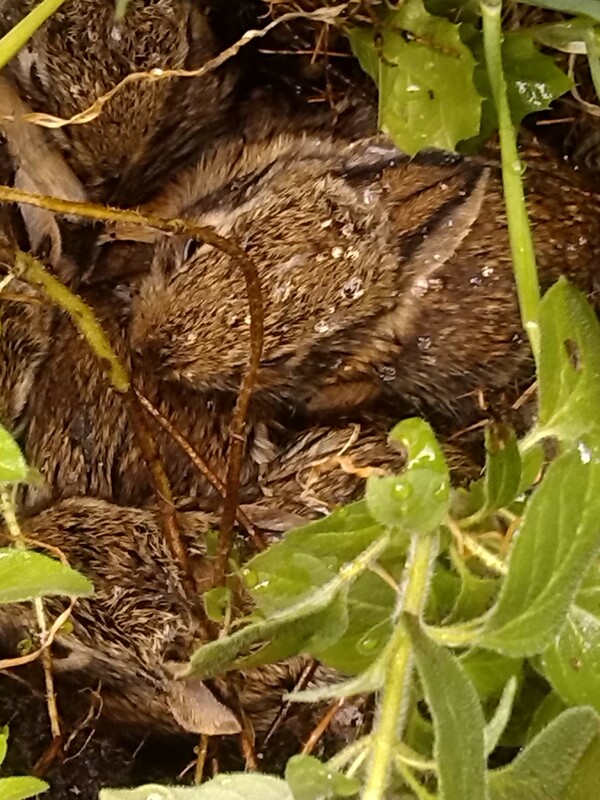 I Googled ” Caring For Newborn Baby Bunnies” One thing I learned is the mother can begin a new litter if the Dad messes with her, even the very day she gives birth. That’s why they call ’em bunnies! Thanks for your comment and info. Yes, it was so sad. After writing the blog, I found the last one’s skeleton outside the barrel, lots of hair, and lots of maggots. Yech.